A woman with flipped forelock of hair, Mine Okubo, sits at breakfast table with her brother, Benji, listening to radio about the bombing of Pearl Harbor, Hawaii in Berkeley, California on December 7, 1941. Dressed in dark skirt and cross-patterned top, Mine sits in profile in wooden chair facing radio on wooden table. Benji sits at left in plaid sweater with head resting on hand at right. Sink in counter at top left. Signed at bottom right corner: Mine. Written in pencil, bottom right corner: 6. Written and circled in pencil, bottom left corner: 6. Stamped in black ink on back, top left corner: 5191. Written in pencil on back, bottom right corner: 6. 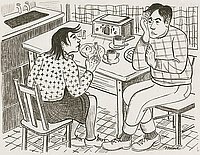 Drawings for the book, Citizen 13660, began as sketches and drawings created by Okubo while incarcerated at Tanforan and Topaz to tell faithful friends about camp life and were intended for exhibition purposes. Drawing is on page 8 of book.